On May 3rd we reported the delivery of the 36.4m explorer yacht Lars and now Maarten Ten Holter at Vripack asks me to broadcast the news that he's signed her for sale. Under the supervision of designer Felix Buytendijk, the refit of the 36.4m explorer yacht Lars was completed at Stemat Marine Services in Holland. Originally conceived as the ultimate sea-going tug by Holland’s Made yard in 1995, the build was never completed and her hull was purchased by the current owner at the end of 2010 with a view to conversion. 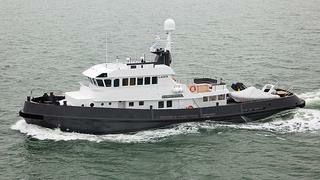 Delivered in February 2012, Lars is now a luxury go-anywhere exploration yacht. Her superstructure has been restyled, a sun deck has been added and she even incorporates a swim platform. Lars has been repowered with a new 1,500hp Caterpillar engine giving a range of 6,420 nautical miles. Bureau Veritas classed and MCA compliant, accommodation is for six guests in three guest suites plus up to five crew. Lying in the Netherlands, Lars is asking €8.9 million.